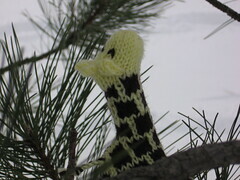 A knit giraffe with charts for simple stranded colourwork. If knitting with 2 colours at once is not for you, the pattern can also be knit as written ignoring the colour directions and the spots can be added in duplicate stitch afterwards. The pattern begins with four legs knit from the feet up. The legs are then joined in the round and from there the body, neck, ears and head are knit all in one piece. This particular guy was knit at 2.5 sts per cm (or roughly 6 sts per inch) resulting in a giraffe that’s 17 cm (6.75 inches) tall and about 7 cm (2.75 inches) nose to bum. Do feel free to knit him up at a different gauge for a larger or smaller toy, there are no rules here! – A light and a dark colour main yarn, any type will do, just choose your needle size as appropriate to the yarn weight. Ideally you would like to create a fabric tight enough so that the stuffing does not show through. Using double-point needles and light coloured yarn, CO 8 sts. Divide sts between needles, place marker and join to begin working in the round, being careful not to twist. Rounds 2-10: K all sts. Rounds 11-21: K following leg chart. If there appears to be a little whole at the bottom of the legs, use the cast on tail to snug it shut and then pull the cast on tail to the inside of the leg. Round 1: K all sts. 32 sts. Round 2: K3, K2T, K22, SSK, K3. 30 sts. Round 4: K2, K2T, K22, SSK, K2. 28 sts. Round 6: K1, K2T, K22, SSK, K1. 26 sts. Round 8: K2T, K22, K2T. 24 sts. With light colour yarn, kitchener stitch the first 4 sts of needle one and the last 4 sts of needle three together. This seam will form the giraffe’s back. You now have 4 sts on needle one, 8 sts on needle two, and 4 sts on needle three. Rejoin yarn for working remaining sts in the round. Add more stuffing to legs and body. Round 1-16: K following neck chart pattern. 16 sts. Pause here and stuff body and neck. Cut darker coloured yarn and secure on the inside of the neck, the rest of the giraffe will be knit in the lighter colour only. Repeat rows 3-4 once more. Pull a 60cm (24 inch) length of the light colour yarn halfway through the last stitch of needle 3 and first stitch of needle 1. Leave it there for later. Repeat rows 3-4 three more times. Resume knitting in the round. Rounds 1-8: K. 16 sts. Pause here. 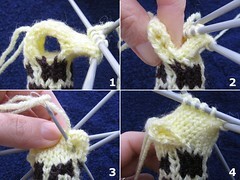 You will see that the previous knitting back and forth for the ears has created a hole on either side of the head (1). Pinch the flap creating the holes (2) and using yarn left at top of ears earlier, use one side to stitch an ear seam that runs from the top of the ear to the outer edge of pinched flap (3), then stitch back up to where you started (4). Repeat using other yarn tail for other ear. Do not cut yarn, we will use these same pieces later for the horns. Stuff head. Round 9: *K2T, repeat from * to end. 8 sts. Cut yarn leaving a tail a few inches long, thread yarn tail through remaining 8 sts, gather and tie tightly, pull tail to inside of stuffed animal. Using the same yarn as used to seam the ears earlier, use one piece to create 3 sts on your knitting needle by passing the yarn over the needle and through the top of the head 3 times. Knit i-cord for 2 rows, thread yarn tail through the 3 sts, gather and tie tightly, pull tail to inside of horn. Repeat for second horn. Tail: Cut two 20cm (8 inch) lengths of light coloured yarn and one 20cm (8 inch) length of dark coloured yarn. Pull all three half way through a stitch at rear of giraffe (makes six strands). Divide strands into three groups of two and braid a short tail, knotted at the end and trim. Eyes: Using length of contrasting yarn, embroider eyes. What a cute toy, I can’t wait for a reason to make one. 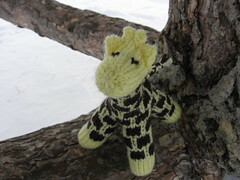 Pingback: Lime & Violet’s Daily Chum » Blog Archive » Free Pattern: Adorable Giraffe Toy! Lovely! My 14-month old has adopted the giraffe as her ‘theme animal’ so I’ll have to make her one of these. Your such a super knitter !! I have a little niece with a giraffe fetish after watching Madagascar 5,496 times. I’m so happy to find a pattern to knit her one. LOVE IT! I LOVE the giraffe, and I know that my kiddos will too. Now I just need to find some yarn to make him! I love this giraffe – he’s actually really easy when you get going. I’ve already knitted two: one for my cousin’s baby and one for my boyfriend (he saw how cute it was and wanted one for himself!). I’ll post a photo soon. This is SOOOOO cute!!!! 🙂 What patience you have…..
PS: The Mitz still loves her sweater-vest, I’m planning to make her at least 1-2 more. 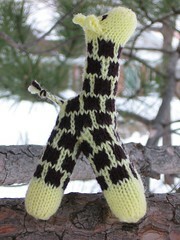 I would absolutely love to make the giraffe. I’m new to knitting. I don’t understand how to follow the leg/neck/body charts. Can anyone help? How delightful! Thanks so much for sharing this special pattern. Love the pattern! I am completely addicted and am knitting a whole family in different sizes (see here and here). I did adjust the neck pattern so the blocks would be centered on each other as in the legs and body… that looks like what you intended, but it looks ok the other way too! Anyway, thanks again for a great pattern. Its so cute. I’m trying it but i a beginner, after you finish the legs how do you continue knitting the body? because you won’t have the wool from the ball right? My little 2.1/2 year-old granddaughter has requested a sweater with a giraffe. Does anyone have a pattern? I’m thinking of having one large giraffe either on the front or back of the sweater. Thank you for putting the pattern on line. I co-ordinate knitters for toys and clothes which we sell to raise money for our local Maternity hospital and we recently accepted a commission for a giraffe. Hello! I just spotted your Little Giraffe pattern. Thanks for sharing. 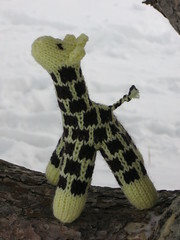 I plan to knit a couple – one to donate and one to give to my friend who loves giraffes. When I get them ready, I will let you know and send a link to photos – with credit to you, of course.